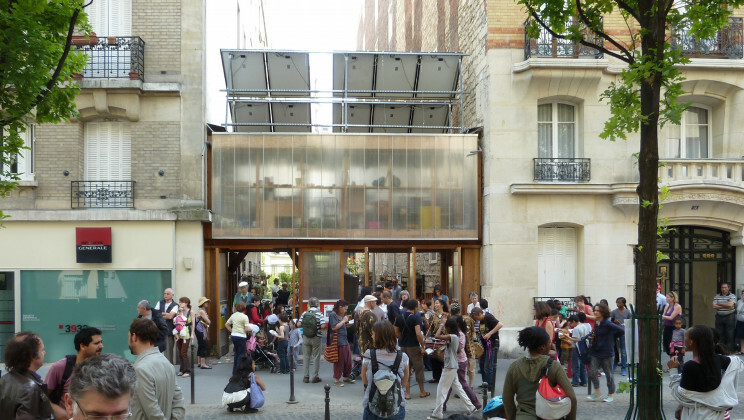 Utilizing the community engagement for generating tactical urbanism projects Atelier d’Architecture Autogérée (AAA) believes the mobilization of people for self-managing their own territories can trigger changes in society. Hulya has talked with Constantin Petcou, one of the founders of AAA along with Doina Petrescu, on their approach for citizen engagement and their researches for the long-term impact of their projects. Hulya Ertas: Your work is mostly based on urban tactics and it is becoming more and more popular, especially among young people. I feel nowadays students and young professionals do not dream of working in the big architecture offices, but rather [they want to] do something good for the society through architecture. But at the same time, I think they are struggling about how to do it financially. Have you figured any solutions to this issue? How do you run your own office? Constantin Petcou: Yes, there is a legitimate interest in the so-called "alternative" architecture in a context dominated by neo-liberal architectural practice and its values. We have coproduced a book called Urban Act, available for download. It includes twenty three practices that are located in Europe, as well as in other places, including Canada. It presents not just projects, but also the specific methodologies and means of producing these projects. The book gives information on the number of people involved in these projects, and whether these people worked voluntarily or whether they were paid. We aimed purposely to provide useful information on how to develop these kinds of projects and not just to show what the projects are and how they look like. We often communicate in seminars and conferences on the processes on which our projects are based, explaining also their economic dimensions; we are immensely concerned by the economy of our projects trying to maintain a mix of paid and voluntary work that will keep the practice sustainable. But I think your question is broader. So, in the beginning of AAA, our practice was very much about tactical architecture. It was initiated by myself and Doina Petrescu, and we were working voluntary on projects, without any commission or funds. This is why we called our process “urban tactics” because our projects were very small and open in the beginning, but they were capable of adapting -so they could opportunistically change functions, and tackle bigger issues such as land availability, political leadership and so on. This is what Michel de Certeau called a “tactic” -comparing it to strategy. At the same time, this “tactical” practice is a way to be more in contact with others, and to have a better dialog with ordinary people in order to generate a popular architecture, or at least an accessible architecture for people. Sometimes people feel that what we are doing is not architecture and for us, this is very important; whether or not they feel like it is architecture. In fact our projects are meant to change the perception of space; the political, social, economic, cultural space... Most of the time the participants in our projects start as simple users, then gradually take responsibilities -to take charge of something, like managing the space, organizing events, cooking or gardening. And step by step they start to become stakeholders of the project. One or two years after being involved in our projects, people start to be more politically aware, they start to ask questions: Why the municipality won’t develop here a project for us; or why is the developer lying about the land value and exclude the existing inhabitants from the process? Gradually, they start to be more informed and more critical about existing urban policies, and urban practices. So fundamentally, they start to participate in understanding politically the architecture and the city. HE: What about the architects? In your bottom-up practices, if you think about the people living there, it is a very different relationship between the architects and the clients. What is your limit on involvement? You do something, and at a point, you leave. How do you make this relationship work? In the beginning you are an outsider, and then you become an insider, and then you are an outsider again. All these things must have a psychological effect on all of you as well. CP: I will start with a paradox. In fact, in the beginning, the residents are, in a way, outsiders, because ordinary people in developed countries expect everything to be done by the political powers, from the city mayor or the municipal council… They are somehow outsiders of the production of space. Through our approach and practice, they start to be more involved, they start to be the co-producers of the space they use. It is a way to be concerned by the “right to the city”; because the residents fundamentally have such a right. However, they do not know how to exercise it. In our projects, they start to become local stakeholders, and at the same time, they start to reclaim specific uses, and specific programs to be developed. They also start to be more involved in the city (in the) life of the neighborhood they are living in, and also, in the city in general. We, as architects, are initiators of the process, being involved from the beginning, and when the project is developed enough, we start to be less and less involved, and eventually leave when the project starts to be run by the users themselves, now stakeholders. It is an emancipatory process, making the transition from co-management to self-management; our collective is called in fact, Atelier d’Architecture Autogérée (meaning Studio for Self-managed Architecture in English) because we try to propose conditions for an emerging self-management of the city, part by part, project by project. And when the project becomes self-run, self-managed, it is important for us to leave the emerging stakeholders to continue the management process by themselves. But we keep in contact with them and most of them become part of our network, like the other partners we have. HE: Through my education at school, as well as in the current practices, “Architecture” is too much concentrated on the end product. With your work however, it is much more about the process and the afterlife of the project. I think you are also bringing in a new kind of an understanding with regards to the time of the project. Practices like yours, with bottom-up and democratic processes, are becoming more and more visible. Do you think these are becoming mainstream, or will they stay as a marginalized way of doing architecture? CP: In the beginning, we were labeled as “alternative” practice, but I hope this practice could become mainstream. That could be recognized as one of the ways to do architecture. For us, architecture is not just concerned with buildings; it is much more about the use of the space. Our understanding of space is very close to Lefebvre’s idea of socially produced space. He wrote about the process of the production of the city, starting with the use and the users, and then with space, and only at the end, with the architectural objects. In a way, this is what we do. Our projects are usually experimental projects, so we don’t know exactly how the project will evolve. We test different uses, different prototypes with different stakeholders. That’s why these projects are very adaptive, very “tactical”: they start by creating conditions for emerging users. These kinds of projects create the possibility of emergence of communities that didn’t exist initially. People from different areas and different milieux come [to join the project]; they start to know each other, and step by step they start doing things together, creating emerging collectives. And the collective [created] is a living system. HE: If we talk about like a specific project like R-Urban, how did you come to initiate it? Where did you start? And at what point did you consider it as self-managing enough for you to leave? CP: All our projects are in a way similar to each other, but also different, adding each time a different line of inquiry. R-Urban is much more strategic; it has a long-term strategy to it. In the beginning of R-Urban, we tried to propose bottom-up solutions to existing global crises ie. climate change, food shortage and current economy, as well as related social and political problems. Some of the key stakeholders of our former projects, have been offered facilities to test self-management, and started new projects after our departure, following the models they have learnt with us. So in a way our projects started to be rhizomatic; they were multiplying. They were rhizomatic and dynamic, and one of our hypotheses for how to realize change was based on this observation: in order to address the global crisis, one can act locally and participate into a concerted collective action that could become a global civic “movement”. R-Urban was meant to be such a movement. For this, we try to develop a pragmatic R-Urban charter, one that can be also adopted internationally. We are deeply concerned by the conclusion of many scientific studies about the ecologic footprint of our society: we produce much less than we consume, as if we would have two or more planets. 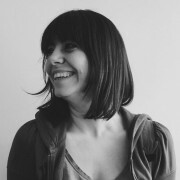 In order to allow citizen to participate in the reduction of this ecological footprint, our idea was to start at the level of everyday practice and support lifestyles that will reduce consumption and pollution, that will recycle, use green transports, share and mutualize resources etc…- to encourage an engaged everyday life controlled and developed by the people themselves. So we initiated the R-Urban project after some months of studying different analyses by IPCC (Intergovernmental Panel on Climate Change), WWF (World Wide Fund for Nature) and similar organizations. We visited interesting European projects from Stockholm and London, as well as some eco-villages in Germany and in the south of France etc. 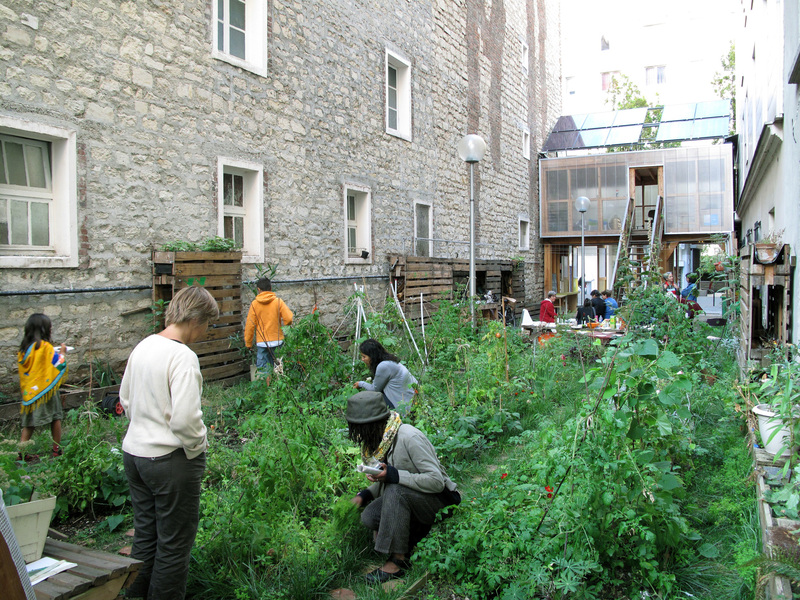 And we have seen many experimental projects concerning cooperative housing, retrofitting, ecological repair and so on. Although very positive, the limit of all these projects was that they were run by educated and ecologically literate middle classes. From our point of view, this was not enough of an effective action to generate global change. So we tried to propose an approach that makes the project possible to be adopted by ordinary people. This is one of the important objectives that R-Urban seeks to achieve. 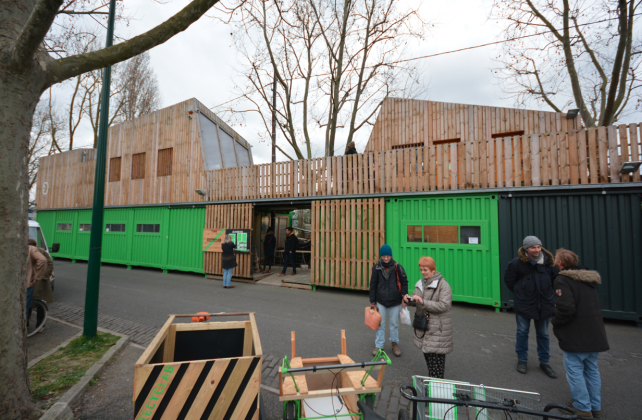 The first R-Urban developments have started in Colombes, in the Parisian Region in 2011, with the construction of two hubs: Agrocite – a Hub of urban agriculture and Recyclab- an eco-construction and recycling Hub. Currently, due to political and ideological changes within the municipal team in Colombes, the project is in the process of being relocated. Other municipalities contacted us to develop similar hubs and to extend the R-Urban model, for example in Genevilliers and Bagneux. So, together with the relocation of the Agrocite and Recyclab, we are now preparing two new R-Urban units that will be built this autumn. We have also developed an international network that will organize an eco-festival, to spread further the R-Urban movement. So now, after nine years from the beginning, there are a lot of civic stakeholders (ie. organizations, entrepreneurs, ordinary citizen) who contact us to be part of the R-Urban movement. HE: As far as I read in an article on Footprint, you had this survey with the participants of the R-Urban project, while the project was in use. Did your initial dreams come into being, and how do you feel about it now? CP: It is different. 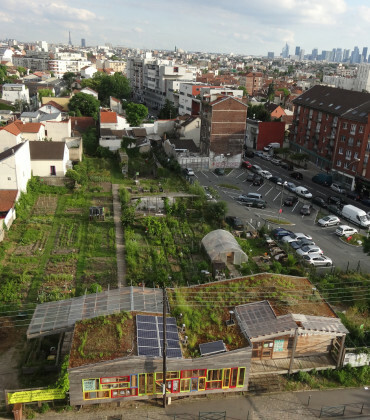 R-Urban proposed a change of everyday lifestyle, demonstrating that it is possible to produce and consume local food, to recycle and reuse urban waste and produce energy in a suburban neighborhood. The local people involved in R-Urban are more and more concerned with these practices; some of them have changed only their everyday life habits, but others have also created jobs for themselves, becoming stakeholders at a regional scale. Some have started to become pioneers in some areas, such as this Agrocité stakeholder who has developed a pioneering school of compost at the regional level. Parallel to them, there are other researchers, teachers, writers, ecologists and intellectuals who regularly contact us for visits, information, seminars, etc. They are less involved in practice, but are interested in developing new ideas, and advancing research on resilience. Also we welcome municipalities and institutional representatives interested in developing or supporting R-Urban. HE: But you say that everyone may also not be working. The issue of “who is participating really” has been discussed a lot. Can you really get marginalized people [involved] in the project? Have you developed some tools to facilitate a feeling of belonging to the space? People want to have these participatory processes, but in the end, sometimes it ends up being just white men. CP: Because those processes are too short in time. This is why our projects are long-term processes. R-Urban started nine years ago, which is quite long period of time. We had recently these issues with the new municipality in Colombes and we postponed as much as we could the relocation of the hubs to make sure there is enough time to build up confidence with the stakeholders and to be able to have a sustainable economic model for each hub. During the last year, the Agrocite hub managed to be self-financed, because the stakeholders managed to develop local economic activities and cover part of the maintenance of the hub. To get the participation process right, to get the involvement of everyone there are different ways to act. People are different. They have different values, different availabilities and different skills. Sometimes they work during the day sometimes they work at night. You must be inclusive of all these kinds of availabilities. For different reasons, some of them remain only users, other become proper stakeholders. If there is a group of 40-50 people from which half are stakeholders, that is good enough. Even what we call “just users” sometimes help with maintaining the place. There are different ways people can contribute. So we have to understand these various everyday conditions and accept them. They are not only men; there are also women, many women. They are not just white. They are not just old. They are different from each other. There is however some predominance depending on the location of the hub and the demographics of this location. In the suburbs we have a huge cultural diversity. HE: How do you transfer their ideas into design? Everything might get lost in translation. CP: I am not sure if it is very important who designs [the project] and how it is designed. I never “draw” a project, but I use to listen to people a lot, and make sure I design a context in which the project can grow by itself. I need to pay attention to all the parameters as much as possible. It is like in permaculture. In permaculture, the plants do not need your care. You know the plants very well and you try to organize the environment in a way so that the cycle does not stop. Our design is similar. We try to draw less, but welcome what people need. It is very organic; it is not a formalist processes. If the project can run on its own, that is a very good design for me. It is a form of co-design in which we act as translators. We are not like a writer but like a good translator who understands both user and specialist language. We have to translate a lot of things: regulations, social context, governance, dynamics ... Finally this translation can also be done by drawing; but it is not just our drawing, it is the result of a collective work. HE: I think it is important that you start with a conversation, and not with a project. CP: It is to enable the construction of the capacity to dream about the project and its future; the capacity to change something. We create the co-discursivity of the project together with the users. According to Foucault, the discursive position is a power position. Usually, in conventional architecture, users are using the project which is otherwise conceived by others. Here, the user can become a stakeholder, and than co-design and build the project physically with us, being also able to build it symbolically, and discursively. And when we leave the project they are able to continue to communicate about it, because they were part of a co-discursive construction. They build up their own motivation to rethink architecture, politics, activism, labor and ecology. In the first two years of the EcoBox project, there were only few people involved, mostly architects and architecture students. Seeing the project emerging, other people from different cultures started to join in from time to time. Politically, the important issue was to help them to make this shift from the first motivation to join in, to start to take responsibilities and be involved in a new kind of civic activism. Some users started by forming small gardening groups, and then started to join other groups of cultural or political action. What is important for us is exactly this re-subjectivation process, which involve subjects to emancipate themselves politically and civically. HE: This is kind of turning everything upside down; since we have always thought the power of neoliberalism as implemented on space. And you are saying the power can be challenged via spatial practices by giving people abilities of political awareness. CP: We use temporary empty space in the city as resource that is temporarily out of the speculative economy of developers. We use people’s free time -which is a resource for unemployed or retired people- in order to transform this free time into a positive asset. We started Ecobox voluntarily and uncommissioned. We invested personal money to pay out for key items. And it is interesting to see that during the periods with no funding, the space was hosting a peak of activities. There create different kinds of economies, which demonstrate that we do not have to rely on the existing capitalist economic models. First we create a spatial opportunity. Usually within the exiting forms of public space there are no spaces open for productive activity for citizen. We are rather pushed into consuming the public space. 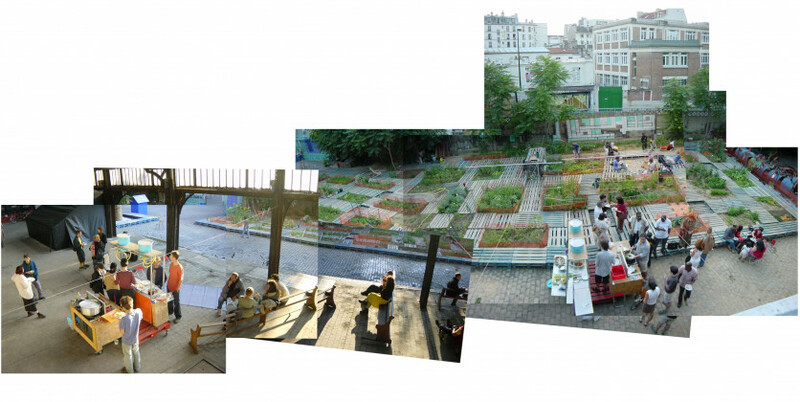 Our work goes in an opposite direction: we create conditions for producing collective uses for new kind of civic spaces. HE: And are these places managed in a non-hierarchical way? How are they managed? CP: They are more horizontal. But there is responsibility to be taken, and responsibility might generate some kind of hierarchy within the project. However hierarchy is not a good word to understand this condition. The project has a structure; it is not unorganized. Participants have different roles, although some of them do not want to take full responsibility, but want to share this responsibility instead. So sometimes there are three presidents, three secretariats, because no one wants to be “the” one. This is for us an appropriate way of co-managing. In France and others European countries, within the current post-welfare state condition, many people are still aiming to keep their assisted positions and are not really used to think about economy. They do not usually have entrepreneurial skills and experience. Assigning them roles in participative projects and supporting them to develop entrepreneurial activities is a way to involving them actively and allowing them to take charge of themselves while they learn to collaborate with others. Dynamic stakeholders are key for a project that wants to work as open source system. Constantin Petcou is a Paris-based architect whose work stresses the intersection between architecture, urbanism, service design and semiotics. 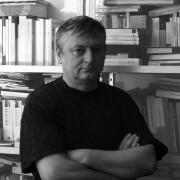 He is co-founder together with Doina Petrescu of Atelier d’Architecture Autogérée (AAA), a professional organization which conducts actions and research on participatory urbanism and architecture which involve local residents in self-managing projects in their neighborhood, engaging in social and ecological practices, and initiating resilient networks. AAA has been laureate of Zumtobel Prize for Sustainability and Humanity 2012, recipient of the Curry Stone Design Prize 2011, the European Prize for Urban Public Space 2010, and the Prix Grand Public des Architectures contemporaines en Métropole Parisienne 2010, and has been a finalist at the EIB Social Innovation Tournement 2014.